One of the saddest events in San Francisco history took place here in 1978 when former city supervisor Dan White entered City Hall through a side window then shot and killed Mayor George Moscone and Supervisor Harvey Milk. Milk was the first openly gay individual to hold an elective office in the United States. 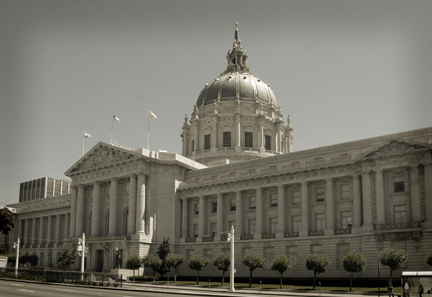 White had previously resigned the board of supervisors following the enactment of a gay rights bill which he had opposed. White was convicted only of voluntary manslaughter and sentenced to seven years and eight months, a sentence widely denounced. Harvey Milk was named to TIME magazine's 100 Most Important People of the Century.